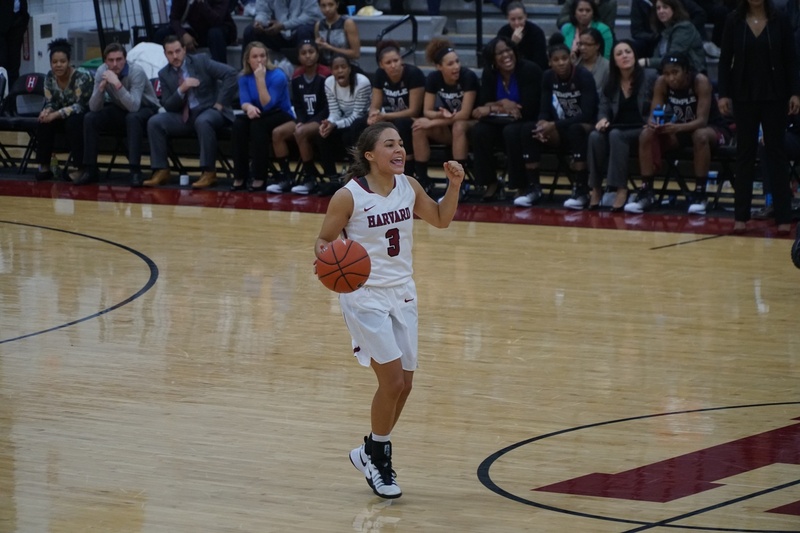 Freshman point guard Katie Benzan helped Harvard to its eighth consecutive victory. The Crimson defeated Kansas, 69-59, on Wednesday night in Lawrence. The Harvard women’s basketball team did not get off to the start it wanted in Wednesday night’s road contest against Kansas. In the first three minutes of the matchup between the Crimson (8-1) and Jayhawks (3-5), it seemed as though the magic that Harvard had at the start of the season had finally run out. The Crimson had five turnovers to go along with only one attempted and missed shot, and on the other end of the court the Jayhawks would jump out to an 8-0 lead. It looked as though the homecoming for senior guard Grace Keane would not have a happy ending. Harvard coach Kathy Delaney-Smith would call a timeout to regroup and settle her team. The Crimson came out of the timeout looking more poised and would go on to outscore Kansas, 69-51 the rest of the way. The 69-59 victory at Allen Fieldhouse was the team’s eighth consecutive win. Wednesday’s victory was the team’s first victory over a power five conference opponent this season. Despite not having the prestige around its program like the Jayhawks do, Harvard had two options for its trip to Lawrence. The first was to show up and have a lackluster performance and leave the Sunflower State after a memorable couple of days and having played in one of college basketball’s most historic arenas. The second was it could fight and prove that the one-loss record was not a fluke. The Crimson chose the latter. Boehm may have been just another freshman in Kansas’ gameplan, but she played like she had everything to prove. The Winnetka, Ill., native recorded 12 points, five blocks, and 10 rebounds, with four of the boards coming on the offensive end of the floor. After the Jayhawks jumped out to the 8-0 lead, Harvard finally responded with a three-pointer from freshman guard Katie Benzan. The first quarter had many inconsistent stretches for the guests, but they would finish the quarter ahead 17-13. In the second quarter, the Crimson did a better job of finding its stride on the offensive end. Kansas would win the second quarter, aided by four 3-pointers, but that did not throw Harvard off its game on the other end. Against a streaky shooting, perimeter-oriented team, the best response to the Jayhawks’ shooting was to stick to the game plan.